This entry was posted in Bucket List, Playing & Sports and tagged bitchin' ol' boomer babe, Bitchin' Ole Boomer Babe., BOBB, Bobbi Rankin, boomer, Bucket List, Half Dome, live life, story telling, storytelling, Yosemite. Bookmark the permalink. Thanks Malati. I think the experience served me more than the other way around. Still enjoying the euphoria of that moment. Bobbi, I know how much work you guys put in to prepare for this adventure…congratulations. I really enjoyed you’re description of the experience. Are you really going to do it again? Congratulations Roberta! You’ve undergone strenuous, consistent training for this hike for two years now. I’m so impressed. 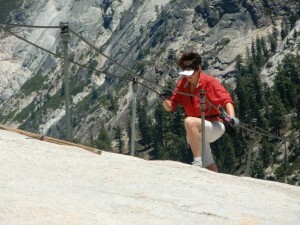 For those who don’t know, Roberta first did this hike last year. Unfortunately, the cables to the final ascent were down due to late snow. Not considering this a failure, (such a positive attitude), the hike this year was immediately planned. What a bonus to be in the company of Mr. Half Dome, your original inspiration. Good for you! Yes AS, two years in the making and worth every minute. But for all, a goal in life is so worthwhile to prusue. Follow your dreams, you never know where they will take you. It was a great day. Congrats on this major goal. You can do anything now! It was a great day Rick and you were diffinately a good part of that journey. As AS said, I read your book before last years trip, it was great information. Then I got the newer edition and it was more inspirational. Good job. The day was fun along with it being the fruitation of a two year goal. Thanks for all your help and encouragement. Next year is diffenately in the picture. Yes Jim I’ll do it again next year and maybe the year after that. Why not, I say to myself, enjoy it while I can! Roberta, I want to hear about the trip back down! You are very brave, don’t think I would be up to it. Well Marge, I guess I didn’t fly back down…..;) It didn’t take as long to go down as it did to go up, but I guess that’s pretty obvious. At the end of the day it felt good to lay down in my bed. Dona, so glad I could share this adventure with you! Bobbi, I can feel the excitement of this hike to which you clearly committed some time back. It’s an inspiring story that causes me to ask… what lofty goal can I set to inspire myself to push my limits of physical and emotional joy?!!?? YOU deserve the congratulations on this!!! Thank you for sharing. Ah Beth, thanks. You deserve to find that goal that will inspire you and take you to a place you’ve never been. Go for it! Great story Bobbi. Very much enjoyed having Shinazy and Daniele stay with us. No Half Dome here but some good hiking. Maybe you should think of a trip out our way! Well Bill, I’ll consider that. It would be so fun to spend time with you all and see what hiking options CO has to offer. 😉 Glad you have a good time with Shinazy and Daniele. Hey Terri, so glad you got to read my story. Thanks for the encouragement. I’m enjoying this time in my life and I keep coming up with more to write about so, stay tuned.